Three views of Venus' solar transit in 2004, taken by NASA's sun-observing TRACE spacecraft. The top image is in visible light; the view on bottom left is in the ultraviolet, and the one on bottom right is in the extreme ultraviolet. AUSTIN, Texas — This year, skywatchers will have the chance to see an astronomical event so rare that it will not occur again for another 105 years: the shadowy passage of Venus across the face of the sun. On June 5, Venus' orbital path will take it directly between Earth and the sun, in what astronomers refer to as a "transit." During this infrequent cosmic event, Venus will cross the solar disk and appear as a tiny, moving black dot, covering just 0.10 percent of the area of the sun, said Jay Pasachoff, chair of the astronomy department at Williams College in Williamstown, Mass. Pasachoff led a panel discussion about the transit of Venus on Sunday (Jan. 8) here at the 219th meeting of the American Astronomical Society. Only six Venus transits are known to have been observed by humans, with the first in 1639 and the others following in 1761, 1769, 1874, 1882 and 2004. The beginning of the transit will be visible from all of North America, Hawaii, the far northern and western regions of South America, northern and eastern swaths of Asia and Australia and New Zealand. Observers in Alaska, Asia, Australia, parts of Africa and Eastern Europe will be particularly well-placed at the end, when Venus exits the solar disk. 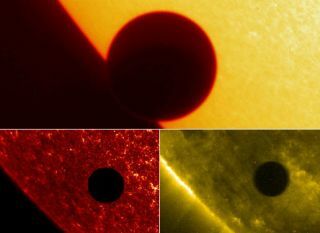 Since it was first observed by humans, the transit of Venus has inspired mystical wonder, and there is a growing body of research on how the experience has been received by members of the public outside the astronomical community, said Chuck Bueter, an astronomy education and outreach advocate. Bueter sifted through historical documents to examine how the populace reacted to previous transits of Venus. He found evidence of poems, songs, operas and paintings dedicated to the peculiar planetary alignment, indicating how much of an impact the transits had on people all over the world. Most recently, in 2004, webcasts and streaming videos allowed people to participate widely in the event, and enabled anyone to have access to the special experience. "Perhaps the way we reached the masses the most in 2004 was through the Internet," Bueter said. He challenged everyone in the audience to draw attention to the event, and to promote it to people inside and outside the astronomical community. "To bring it to the public, you have to have advocates, enthusiasts — people who are getting out there and taking the word to the streets," Bueter said. "Spread the word. Bring it to the population." But anyone thinking of catching a glimpse of the transit should understand that it can be dangerous to watch the event without following proper viewing techniques. This involves taking precautions similar to those employed to observe a solar eclipse — using special optical instruments, filters or glasses to protect against the extremely bright solar disk. With the appropriate caution, however, the transit of Venus is an event not to be missed, researchers said. "It's like going on top of the Sears Tower and looking down at 150,000 street lights that are miles away, and you're trying to detect the presence of a gnat flying in front of a streetlight," Bueter said. "We've got a front-row seat to that."